1. Sheps SG, Jiang N-S, Klee GG. Diagnostic evaluation of pheochromocytoma. Endocrinol Metab Clin North Am 1988; 17:397-414. 2. Sutton MG, Sheps SG, Lie JT. Prevalence of clinically unsuspected pheochromocytoma: review of a 50-year autopsy series. Mayo Clin Proc 1981; 56:354-360. 3. Linehan WM, Walther MM. Molecular genetic abnormalities associated with pheochromocytoma. In: Pacak K, moderator. Recent Advances in Genetics, Diagnosis, Localization, and Treatment of Pheochromocytoma. Ann Intern Med 2001; 134:316-317. 4. Whalen RK, Althausen AF, Daniels GH. Extra-adrenal pheochromocytoma. J Urol 1992; 147:1-10. 5. Moulton JS, Moulton JS. CT of the adrenal glands. Sem Roentgen 1988; 23:288. Transurethral resection bladder tumor has been utilized in select case reports. However, partial cystectomy should be the initial approach to treat pheochro-mocytoma of the bladder. Although laparoscopic cystectomy and partial cystectomy are still in their infancy, they are a viable approach to all tumors of the bladder. 6. Glenner GG, Grimely PM. Tumors of the extra adrenal Paraganglion system. In: Atlas of Tumor Pathology. Washington, D.C.: Armed Forces Institute of Pathology, 1973, fasc. 9. 7. Coupland RE. Post-natal fate of the abdominal para-aortic bodies in man. J Anat 1954; 88(4):455-464. 8. Coupland RE. Pre-natal development of the abdominal para-aortic bodies in man. J Anat 1952; 86(4):357-372. 9. Doran F, Varinli S, Bayazit Y, Bal N, Özdemir S. Pheochromocytoma of the urinary bladder. Case report. APMIS 2002 110:10, p. 733. 10. Walther MM, Reiter R, Keiser HR, et al. Clinical and genetic characterization of pheochromocytoma in von Hippel-Lindau families: comparison with sporadic pheochromocytoma gives insight into natural history of pheochromocytoma. J Urol 1999; 162:659-664. 11. Eisenhofer G. Biochemical diagnosis of pheochromocytoma. In: Pacak K, moderator. Recent Advances in Genetics, Diagnosis, Localization, and Treatment of Pheochromocytoma. Ann Intern Med 2001; 134:316-317. 12. Goldstein DS, Eisenhofer G, Flynn JA, Wand G, Pacak K. Diagnosis and localization of pheochro-mocytoma. Hypertension 2004; 43(5):907-910. 13. Lenders JW, Pacak K, Walther MM, et al. Biochemical diagnosis of pheochromocytoma: which test is best? JAMA 2002; 287:1427-1434. 14. Goldfarb DA, Novick AC, Bravo EL, Straffon RA, Montie JE, Kay R. Experience with extra-adrenal pheochromocytoma. J Urol 1989; 142:931. 15. O'Riordain DS, Young WF, Grant CS, Carney JA, van Heerden JA. Clinical spectrum and outcome of functional extra adrenal paragangliomas. World J Surg 1996; 20:916-922. 16. Melicow MM. One hundred cases of pheochromocytoma at the Columbia-Presbyterian Medical Center, 1926-1976: a clinicopathologic analysis. Cancer 1977; 40(5):1987-2004. 17. Ilias I, Pacak K. Current approaches and recommended algorithm for the diagnostic localization of pheochromocytoma. J Clin Endocrinol Metab 2004; 89(2):479-491. 18. Maurea S, Cuocolo A, Reynolds JC, et al. Iodine-131-metaiodobenzylguanidine scintigraphy in preoperative and postoperative evaluation of paragangliomas: comparison with CT and MRI. J Nucl Med 1993; 34:173-179. 19. Pacak K, Goldstein DS. Advances in Diagnostic Localization of Pheochromocytoma In: Pacak K, moderator. Recent Advances in Genetics, Diagnosis, Localization, and Treatment of Pheochromocytoma. Ann Intern Med 2001; 134:316-317. 20. Hwang J, Shoaf G, Uchio EM, et al. Laparoscopic management of extra-adrenal pheochromocy-toma. J Urol 2004; 171(1):72-76. 21. Walz M, Peitgen K, Neumann H, Janssen O, Philipp T, Mann K. Endoscopic treatment of solitary, bilateral, multiple, and recurrent pheochromocytomas and paragangliomas. World J Surg 2002; 26:1005-1012. 22. Janetschek G, Reissigl A, Peschel R, Hobisch A, Bartsch G. Laparoscopic retroperitoneal lymph node dissection for clinical stage I nonseminomatous testicular tumor. Urology 1994; 44:382. 23. Linnoila RL, Keiser HR, Steinberg SM, Lack EE. Histopathology of benign versus malignant sym-pathoadrenal paragangliomas: clinicopathologic study of 120 cases including unusual histologic features. Hum Pathol 1990; 21(11):1168-1180. 24. Glenn F, Gray GF. Functional tumors of the organ of Zuckerkandl. Ann Surg 1976; 183(5):578-586. 25. Kozlowski PM, Mihm F, Winfield HN. Laparoscopic management of bladder pheochromocytoma. 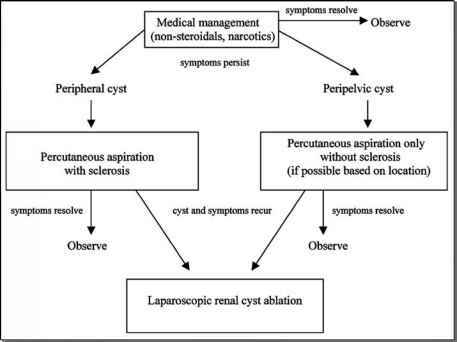 Urology 2001; 57(2):365. 26. Kato H, Suzuki M, Mukai M, Aizawa S. Clinicopathological study of pheochromocytoma of the urinary bladder: immunohistochemical, flow cytometric and ultrastructural findings with review of the literature. Pathol Int 1999; 49(12):1093-1099. 27. Onishi T, Sakata Y, Yonemura S, Sugimura Y. Pheochromocytoma of the urinary bladder without typical symptoms. Int J Urol 2003; 10(7):398-400.